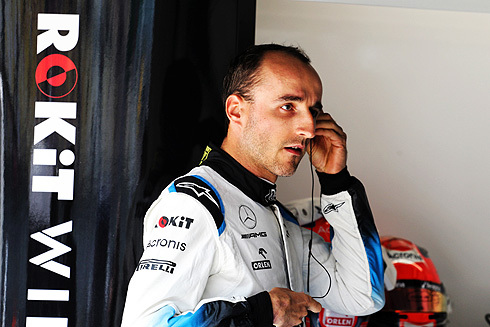 The races leading up to the 2019 Chinese Grand Prix had seen ROKiT Williams Racing driver Robert Kubica suffer the frustrations of not only having a car that was not performing but also a car that compared to his team-mates car was producing quite different results in terms of the data coming from the car. But after having completed the two Friday practice sessions Robert has finally been able to confirm that he is encouraged by a car that now has a "different" feeling. The data that was coming from both the teams cars showed that there was a discrepancy between the cars showing an 8 per cent difference in aero balance front to rear under braking despite the two cars having the same settings. In braking this was seeing the aero balance on Robert's car moving further forwards than that which occurred on Russell’s. This would make Robert's car suffer from more oversteer from the initial turn-in and apex. As for what could be the cause of this it could come down to a difference in torsional stiffness in the two chassis. The team has still yet to resolve this issue but it would see that they are making some progress as Robert's response was more favourable. The two Friday sessions would see Robert finish ahead of his team-mate but was even more encouraging was the fact that the changes that had been made to the FW42 during the sessions have produced the result of changing the handling. AS for whether this was going to see improvements from the FW42 Robert added: “If we haven't done anything to turn it around in the last two months, there'll be nothing happening in 12 hours,” he said. But team-mate George felt that the updates that had been bought to Shanghai had moved the team a bit closer to the cars ahead.